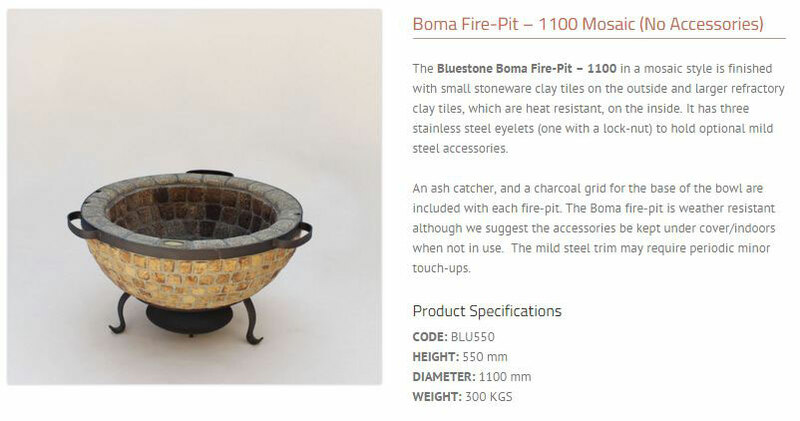 The Bluestone Boma fire pits are designed for use as fire bowls which can double as braais. 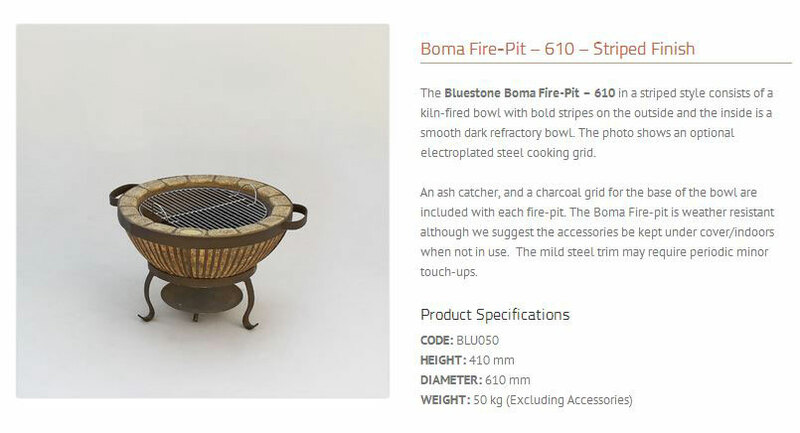 They are made from Bluestone fire clay which is a refractory material that can take heat because it has virtually zero thermal expansion. 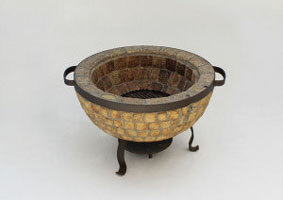 The fire pits are available in four sizes and in two finishes – mosaic and stripe – and are able to take a variety of optional accessories. 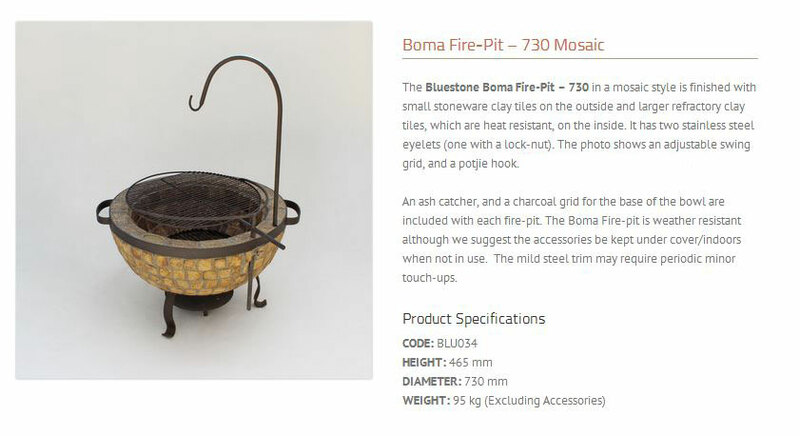 The mosaic style consists of small stoneware clay tiles on the outside and larger, heat resistant, refractory clay tiles on the inside. 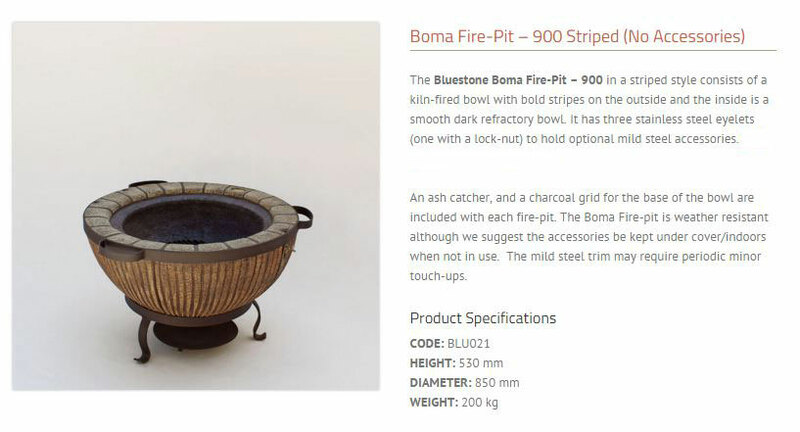 The stripe style consists of a kiln-fired bowl with bold stripes on the outside and a smooth, dark, refractory bowl on the inside. 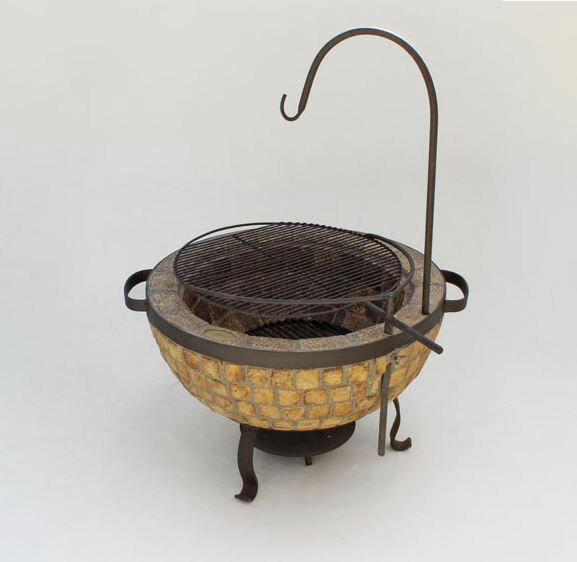 An ash catcher and a charcoal grid are included with each fire pit. 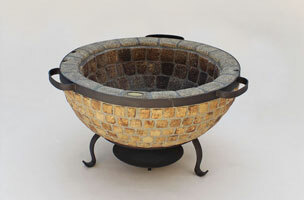 The fire pits are weather resistant although we suggest the accessories be kept indoors when not in use. 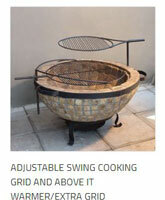 The mild steel trim and accessories may require minor periodic maintenance. 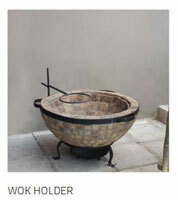 A two year warranty covers damage caused during the proper home use of the items, and production flaws. 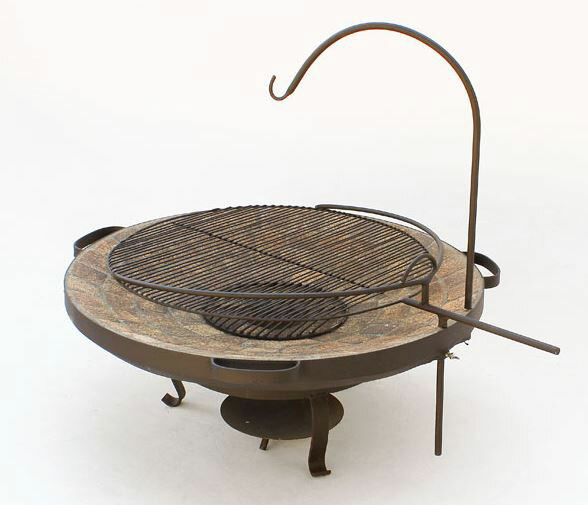 The components are made of superior quality materials and fired in an electric kiln to 1200degrees Celsius, ensuring a high quality product. 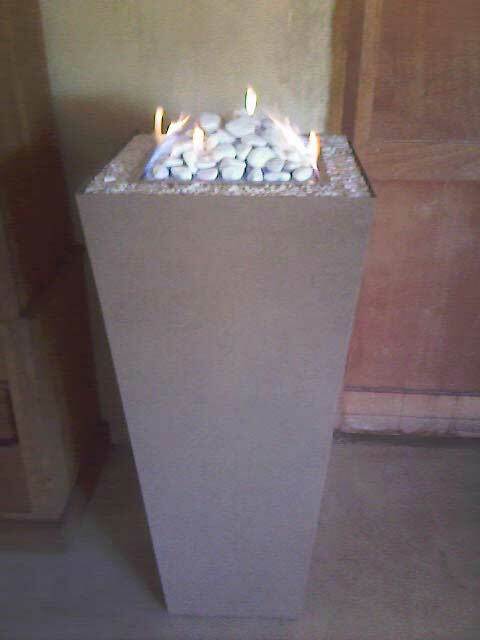 These items are all individually handmade and there may be minor variations in dimension and appearance which contributes to the uniqueness of the products and will not constitute defects in the items or workmanship. 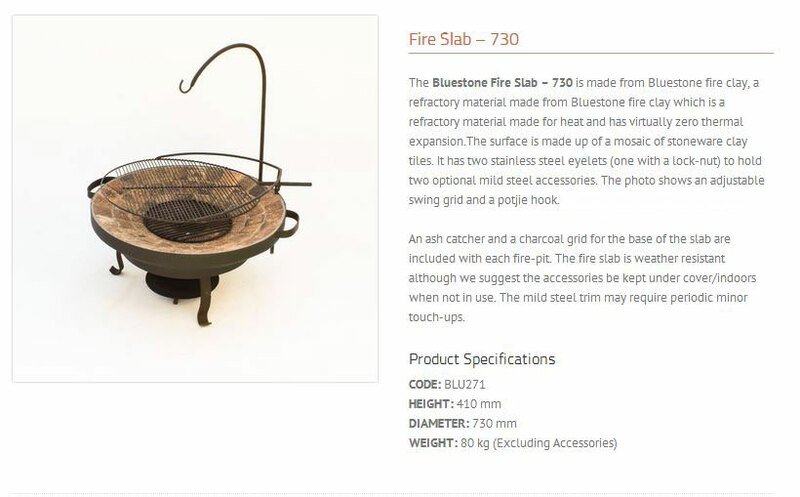 The warranty is voided if the product has been modified or altered or that in Keith Hamilton’s sole judgement has been subjected to misuse, negligence, accident or improper handling or installation. 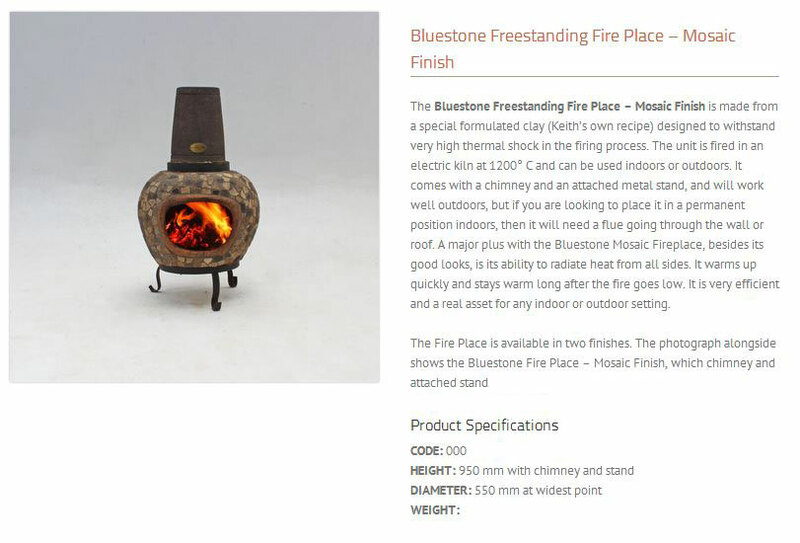 The warranty does not apply to damage caused to the top tiles when fire has been made on top of those tiles.Any claim must be accompanied by the original invoice. 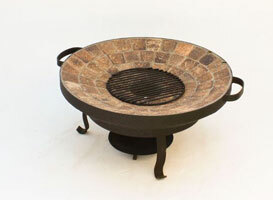 Enjoy many years of use of your fire pit. 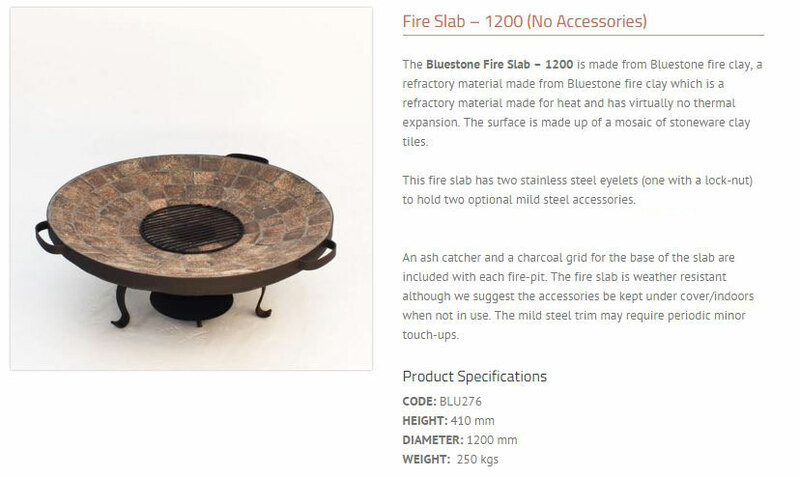 The Bluestone Fire Slabs are designed as an alternative to a fire-pit and can double as a braai. 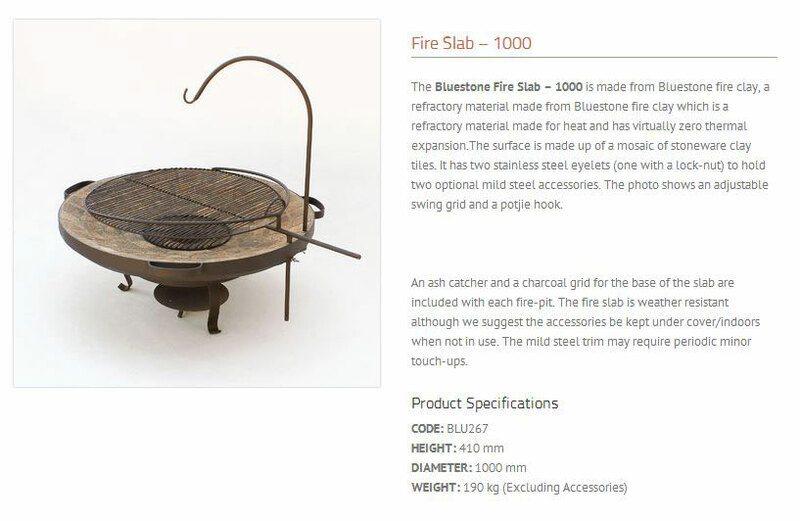 The fire slabs are made from Bluestone fire clay which is a refractory material that can take heat as it has virtually zero thermal expansion. 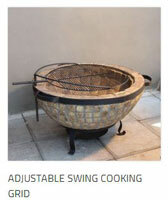 The fire slabs are available in three sizes and can take an adjustable swing grid and a potjie hook. 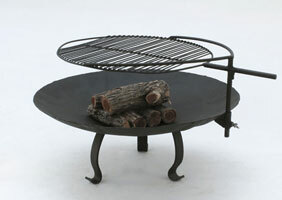 An ash catcher and a charcoal grid are included with each fire slab. 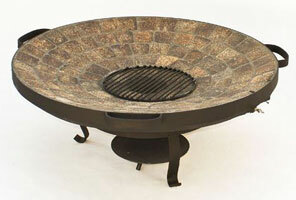 The fire slabs are weather resistant although we suggest the accessories be kept indoors when not in use. 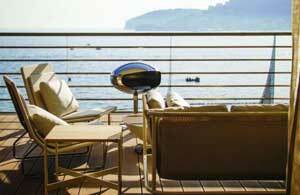 The mild steel trim and accessories may require periodic minor touch-ups. 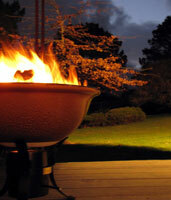 There is nothing quite like snuggling up in front of a warm cosy fire on a cold winter’s night. 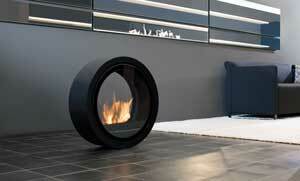 Made from durable, thermal shock proof NilThermTM with a hard wearing glazed surface both inside and out. 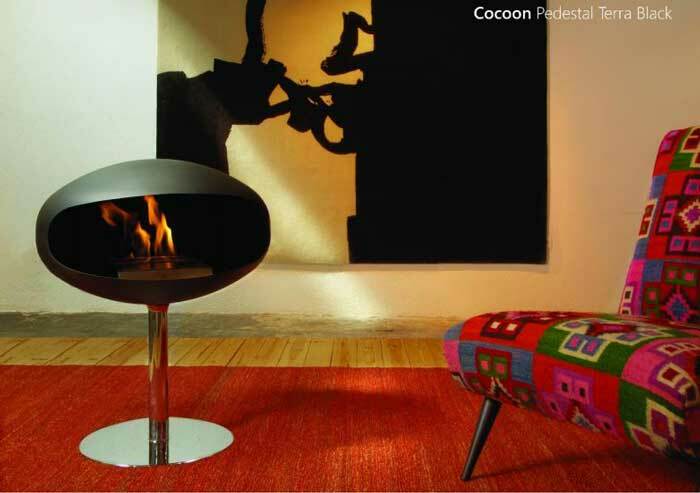 The ceramic body stores heat and radiates a comforting warmth even after the fire has burnt out. 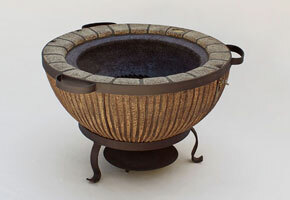 A closed, two-piece ash container makes it clean and completely safe to use on a wooden deck. 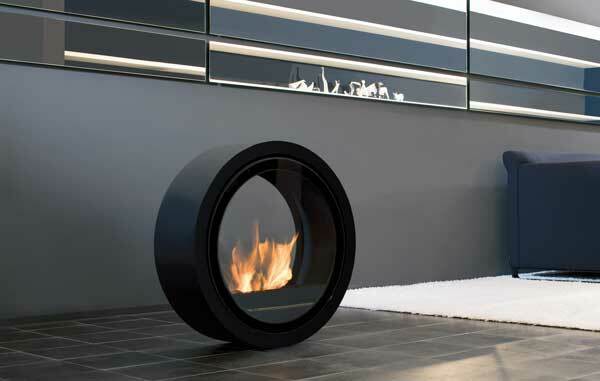 The ash container and stand are powder coated to provide a long lasting and elegant finish that will look as good in ten years as it does when you first bring it home. 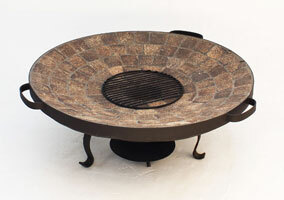 The ceramic fire grate of the Fire Pit should never be used when wet. 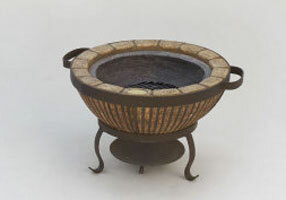 If it is unavoidable to use a wet fire pit, start with a small, cool fire to completely dry the ceramic body. 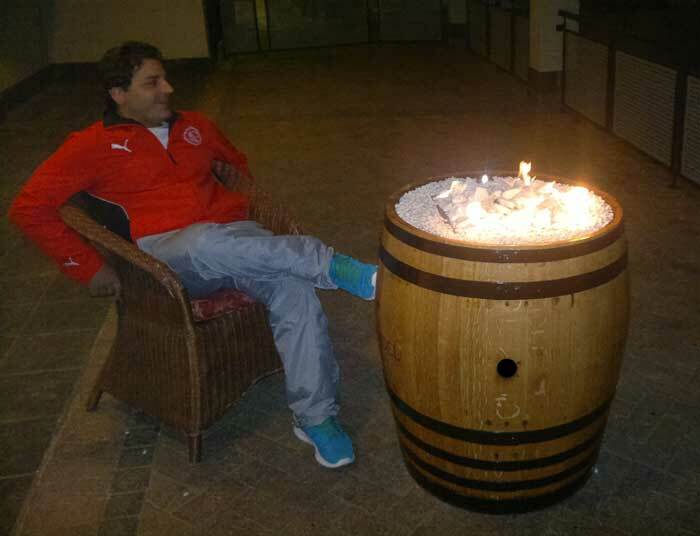 After 20 – 30 min of gentle drying it is safe to make a hot fire. 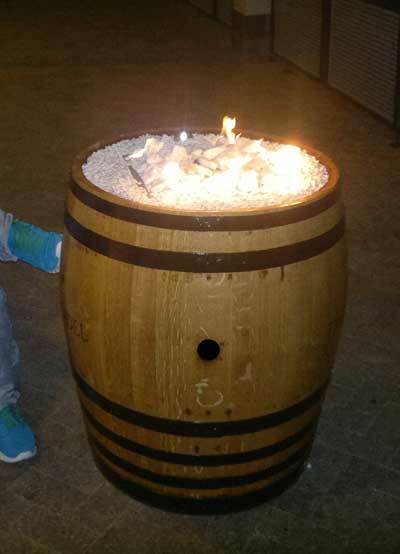 Remember to empty the ash container of water before using the Fire Pit. 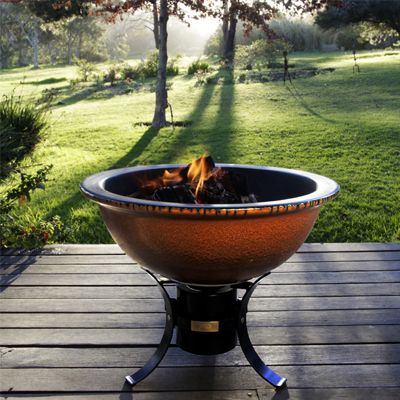 The Fire Pit is guaranteed against thermal shock damage. Dropping or hard knocks, however, are not covered. 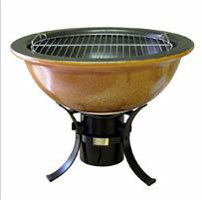 Should any product fail due to an unseen factory defect, Earthfire will honour the warranty. 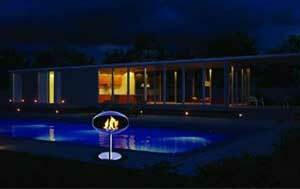 Vulcan Heat Studio is an independantly owned company that endeavors to sell only quality products. 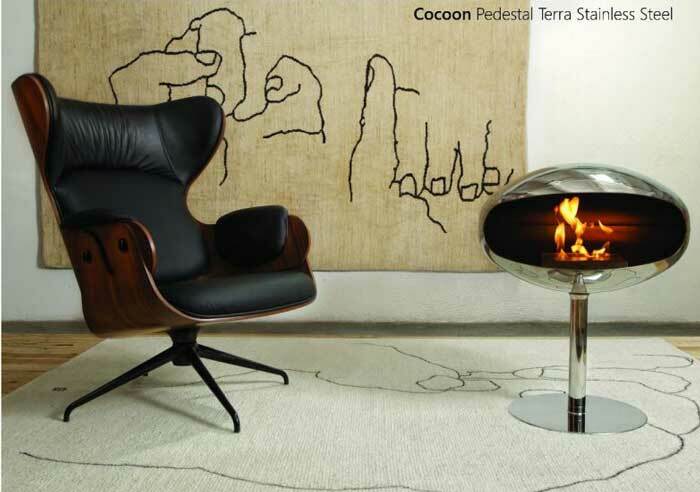 We retail one of the largest ranges of both braais and fireplaces, if not THE largest, of any independantly owned company. 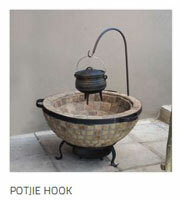 All our products come straight from the manufacturers or importers.